Breitbart News will provide updates on the situation as they occur. UPDATE (10:10 PM EDT): President Obama warns “take care not to rush to judgment” re: bombing suspects. Mentions victims of West, TX explosion and recovery efforts there. UPDATE (10:05 PM EDT): Obama speaking at White House. Straight delivery. Honors fallen, singling out “heroic” slain MIT officer. “We owe a great debt of gratitude” to “excellent” law enforcement officers. UPDATE (9:56 PM EDT): Suspect in “serious” condition. UPDATE (9:50 PM EDT): Ambulance taking suspect to Massachusetts General Hospital. UPDATE (9:46 PM EDT): Presser: commissioner explains that local man who had obeyed orders to stay inside saw blood in backyard when he left his home, led to the boat where suspect was hiding. Man reported his finding to police. UPDATE (9:41 PM EDT): Crowd begins chanting “USA! USA!” between speakers at presser. UPDATE (9:40 PM EDT): Post-capture press conference a lovefest. Lots of thanks and congratulations, poetic language. Admittedly little new information. UPDATE (9:37 PM EDT): NBC: suspect will not be Mirandized. UPDATE (9:30 PM EDT): CNN analysts: police could interrogate suspect without Mirandizing as long as evidence from said interrogations not submitted at criminal trial. UPDATE (9:28 PM EDT): Photo purports to show captive suspect. UPDATE (9:04 PM EDT): Boston Police’s Twitter sums up catharsis among law enforcement and observers. 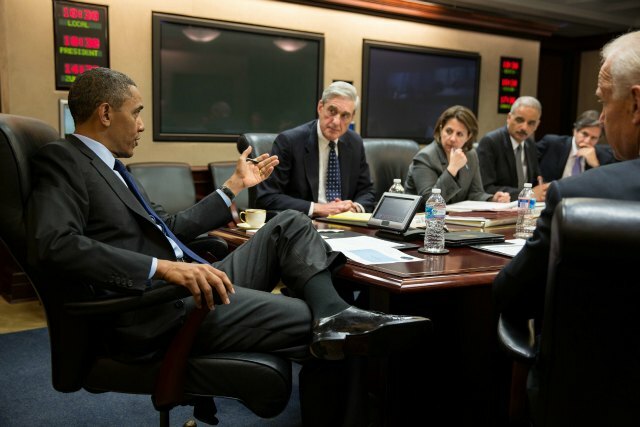 NBC reporting Obama admin will treat terrorist as a “criminal” and not enemy combatant. UPDATE (8:57 PM EDT): Heroes’ welcome. 8:42 PM EDT: Scanner: Suspect in custody. UPDATE (8:37 PM EDT): Many saying suspect is weak but still moving. I wonder if he has strength to exit boat as police seem to be demanding. UPDATE (8:35 PM EDT): NBC: FBI negotiator on scene. UPDATE (8:33 PM EDT): Three more individuals dragged into bomb plot investigation. 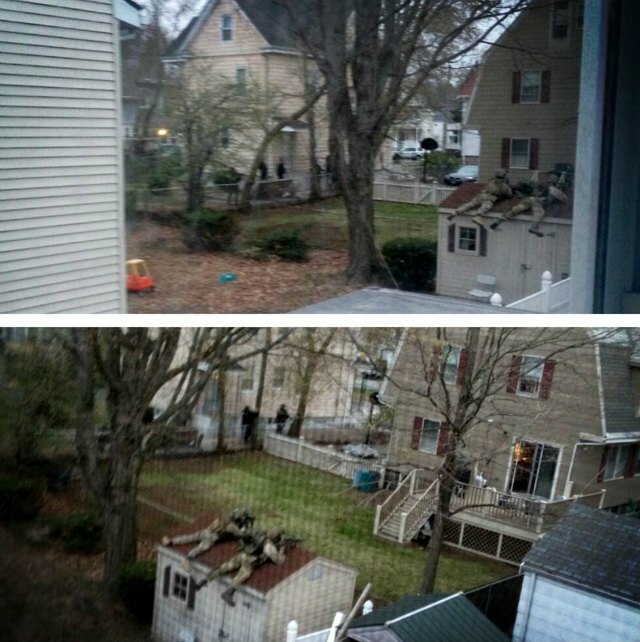 BREAKING NEWS: Three people taken into custody in New Bedford as part of Boston Marathon terror bombing investigation. UPDATE (8:22 PM EDT): Multiple mentions of gasoline filling half of tank on boat. Reports waver from movement to no movement and back, reports of fire/no fire going back and forth less frequently. UPDATE (8:14 PM EDT): Scanner: helicopter on scene has approximately 15 minutes of fuel left. UPDATE (7:56 PM EDT): Scanner: flash bangs deployed, currently negative on boat fire. More shots fired. UPDATE (7:46 PM EDT): Scanner: FBI deploying flash bang. UPDATE (7:45 PM EDT): Scanner: Report of fire or flame on beat. UPDATE (7:41 PM EDT): Movement reported, suspect sitting up. All personnel ordered not to fire weapons. UPDATE (7:33 PM EDT): Multiple local affiliates report suspect is alive and surrounded. Some claim confirmation individual is Tsarnaev, others claim no confirmation. UPDATE (7:27 PM EDT): Scanner: K-9 units approaching suspect. UPDATE (7:25 PM EDT): Scanner: LE orders radio silence. Over 130k viewers of Ustream channel carrying scanner. UPDATE (7:22 PM EDT): Scanner: suspect hid under boat canvas. Plans to rip top off boat with robot/ram/armored car. UPDATE (7:17 PM EDT): Scanner: boat is dry-docked. All non-tactical personnel ordered to leave scene. UPDATE (7:05 PM EDT): Reprise of blood spots, trail heats up. 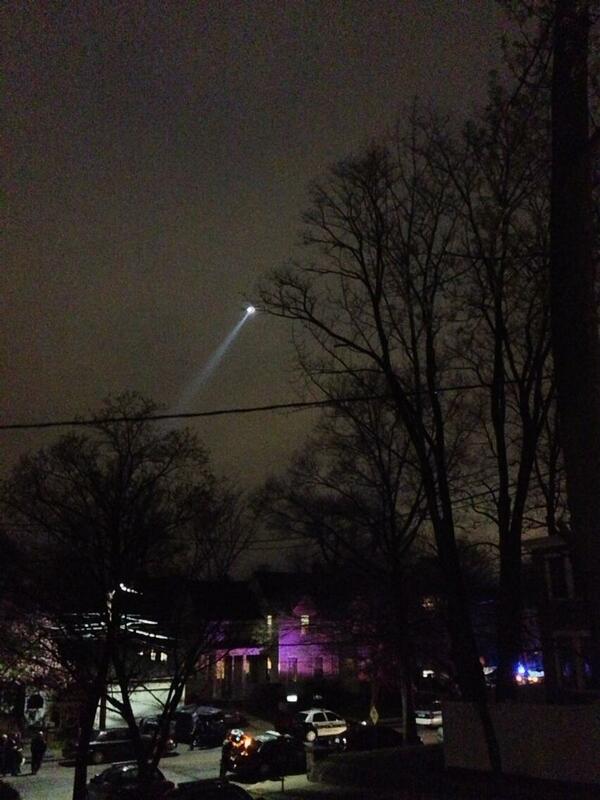 UPDATE (6:59 PM EDT): Scanner: shots fired in Watertown. CNN anchor Drew Griffin describes: about two dozen shots, sounded like police-style automatic assault rifle. UPDATE (6:57 PM EDT): INTERPOL issues global security alert. “The decision by the FBI and US authorities to request an INTERPOL Orange Notice will enable police services and other law enforcement agencies around the world to advise US law enforcement authorities whether they’ve come across similarly designed devices in their own investigations,” said INTERPOL Secretary General Ronald K. Noble. UPDATE (6:21 PM EDT): Presser: Col.: Suspect fled on foot. Do not know where he went. We believe the suspect is still in Massachusetts. FBI has posted an updated Wanted poster. UPDATE (6:19 PM EDT): Presser: Col.: We do not know what kind of vehicle he has. Stresses suspect is very violent and has killed multiple people. Stark contrast from biographical coverage from cable nets. UPDATE (6:15 PM EDT): Presser: Col. says media activity on Thursday may have forced suspect’s actions in evening. Asserts bombing suspects did not rob convenience store. UPDATE (6:11 PM EDT): Presser: Gov. Patrick says residents can leave homes, mass transit will resume operation. UPDATE (6:09 PM EDT): Presser: police commissioner [correction: state police colonel] says 20 streets have been searched, no capture yet. UPDATE (6:06 PM EDT): Reportedly not the first time FBI has taken an interest in older brother. UPDATE (5:54 PM EDT): Scanner: police say search 90% complete, six streets remaining. PHOTO: Cleanup from site of overnight firefight occurring now. UPDATED (5:39 PM EDT): PRODUCT PLACEMENT? This grueling manhunt brought to you by Honda Motor Co., Inc. UPDATED (4:38 PM EDT): Outlets correcting earlier reports of 7-11 robbery. State Police: Bombing suspects were not ones who robbed 7-11 in Cambridge. UPDATE (4:26 PM EDT): Even after bombing and gunfight, at least seven extra IEDs left from suspects’ stash. UPDATE (4:10 PM EDT): THIRD Honda of interest identified. However, link to CT gov’t website is dead. Already acquired by LE? Kyrgyz Embassy confirms Tsarnaev brothers suspected of #bostonmarathon blasts both Kyrgyz nationals. Police remove computer from the jersey home of suspects’ sister. UPDATE (3:09 PM EDT): Search must be nerve-wracking, arduous. Meticulous coverage of relatively small area since daylight, still a good chunk to explore. UPDATE (3:05 PM EDT): Boston Red Sox: Friday game postponed, not cancelled. UPDATE (2:38 PM EDT): Honda of Interest #2 reportedly in police custody. 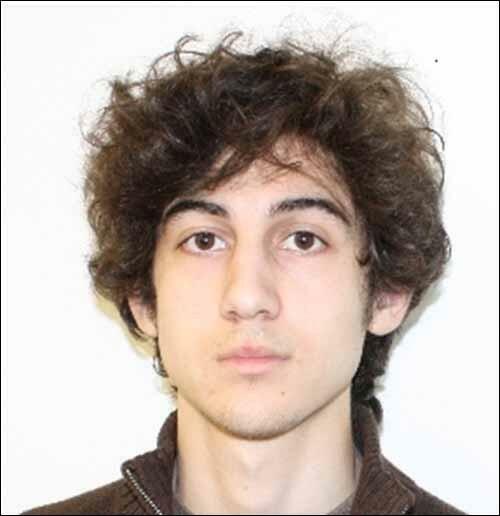 UPDATE (2:16 PM EDT): Police have not been able to track Tsarnaev’s location via cell phone. UPDATE (2:05 PM EDT): Good news on policemen wounded in overnight shootout. St. Elizabeth’s Hosp in Brighton says most of 15 injured officers it treated last night have been discharged, and all will be by day’s end. 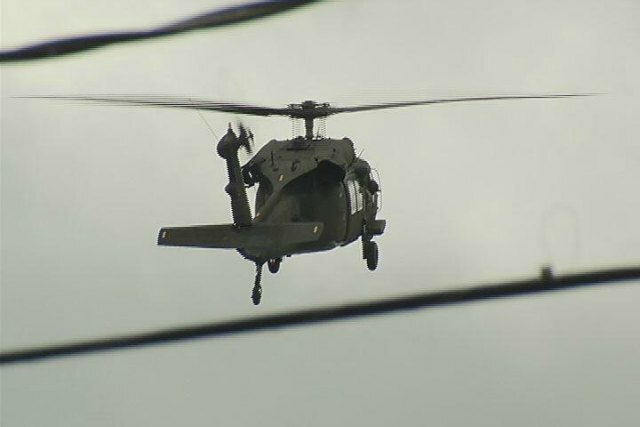 UPDATE (2:01 PM EDT): Connecticut police on alert again, according to Governor’s office. UPDATE (1:57 PM EDT): CNN reporter: police say search of suspects’ apartment is “done.” State police had said controlled demolition would take place first to make search safer for officers. Have not heard on cable nets that demolition was completed. UPDATE (1:55 PM EDT): Lots of police casualties in overnight showdown. UPDATE (1:27 PM EDT): The FBI has interviewed the Tsarnaevs’ sister (no name available) in West New York, NJ, according to the Associated Press. UPDATE (1:15 PM EDT): Deceased older brother Tamerlan reportedly spent six months in Russia last year. UPDATE (1:10 PM EDT): NY car: driver cited for failure to stop at stop sign, failure to use turn signal. Bomb squad involvement explained as “abundance of caution,” same phrase used in announcement of Norfolk St. controlled demolition. UPDATE (12:54 PM EDT): Nothing dangerous found within car stopped in Niagara Falls. UPDATE (12:42 PM EDT): CNN: both suspects claimed asylum to get green cards, eventually became naturalized U.S. citizens. Younger brother received citizenship in 2012. (UPDATE UPDATE): CNN producer says Dzhorkhar became citizen on 9/11/2012. UPDATE (12:38 PM EDT): In a live press conference, a Massachusetts State Police Colonel says law enforcement will conduct a controlled demolition later on the same street as the suspect’s apartment. 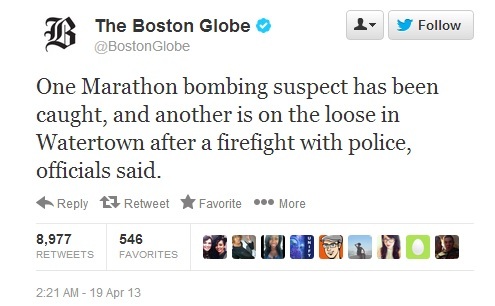 UPDATE (12:27 PM EDT): CNN making a very big deal out of the suspect tweeting after the bombing Monday. Account here. Seems to be confirmation from his friends that it is legitimate. 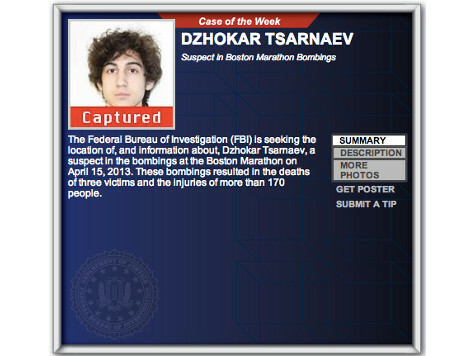 UPDATE (12:05PM EDT): Pete Williams of NBC reports that police may be looking for “two accomplices,” along with 19 year-old Dzhokhar Tsarnaev. 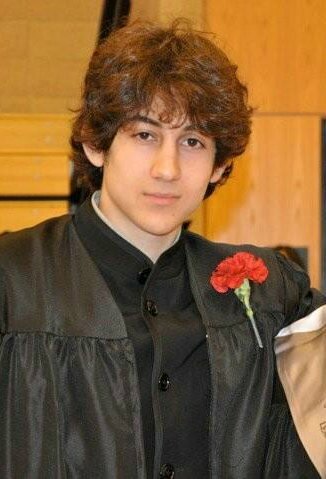 UPDATE (11:54 AM EDT): Numerous media outlets are reporting that the manhunt is now centered on a single Watertown home where police have 19 year-old terror suspect, Dzhokhar Tsarnaev, surrounded. Still unknown is whether or not Tsarnaev is alone, or if law enforcement is speaking with him. Fox News’s Bret Baier reported earlier that capturing the suspect alive is of the highest priority. NBC is reporting that a “third suspect” is being sought in the state of Connecticut. UPDATE (11:51 AM EDT): In a live press conference carried thus far on NBC, MSNBC, and CNN, the uncle of the suspects called his nephews “losers.” He also said that his dead nephew “deserved” to die. 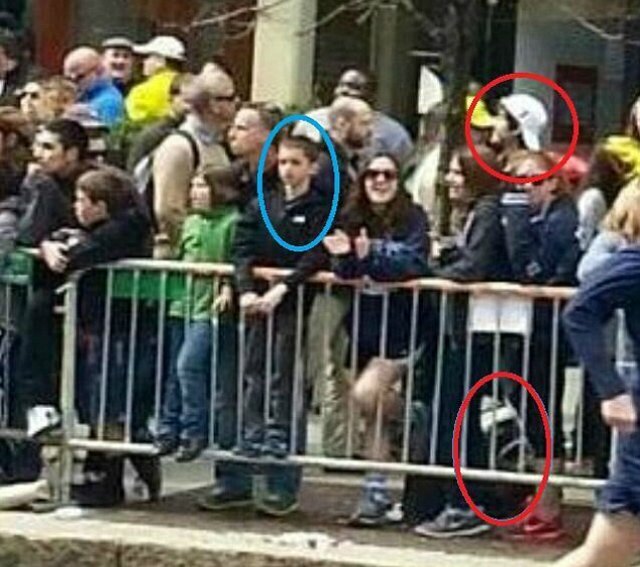 OLD NEWS: This photo started making the rounds yesterday evening–shows suspect, now tentatively ID’d as Tsarnaev, allegedly placing bomb behind 8-year-old Martin Richard, one of the three people killed in Monday’s attack. UPDATE (10:44 AM EDT): Terrible. UPDATE (10:11 AM EDT): The morning’s intrigue expands into another state. UPDATE (10:09 AM EDT): FAA has established a no-fly zone over Watertown, MA. UPDATE (10:07 AM EDT): WCVB TV: UMass Dartmouth is evacuating the dormitory where Tsarnaev lived. UPDATE (9:42 AM EDT): New York NBC affiliate says car pulled over from previous update has Massachusetts plates. UPDATE (9:38 AM EDT): Wounded officer expected to live. UPDATE (9:22 AM EDT): Situation developing outside Massachusetts. No evidence yet of connection to Boston suspect hunt. Police source:2 Russian nationals pulled over in Niagara Falls; 4 suspicious backpacks in the car, robot & bomb techs on scene. Two government sources tell the Los Angeles Times’ DC bureau that the brothers have been in the US for 10 years. UPDATE (9:09 AM EDT): Twitter users find account referenced by police scanner. Has not tweeted before today, only follows Boston Police account. Many accusations of fakery. PHOTO: FBI releases more recent photo of suspect. UPDATE (8:52 AM EDT): Bomb threat being taken very seriously by law enforcement. 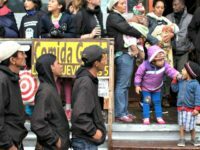 NPR says nervous police have told people approaching checkpoints “Put down your cell phone, or we’ll shoot”–in Boston!! UPDATE (8:36 AM EDT): I heard about 45 minutes ago on the police scanner something about “blood spots” but wasn’t entirely certain. Seems the LA Times corroborates my (admittedly spotty) hearing. FBI source tells the LA Times’ Richard Serrano that searchers have found blood spots, suggesting suspect might have been wounded. UPDATE (8:27 AM EDT): Wounded officer identified. All taxi service in the City of Boston has been suspended pending further notice. UPDATE (8:02 AM EDT): MA Gov. Deval Patrick addressing reporters. Says instructions to stay indoors extend to all of Boston. UPDATE (7:48 AM EDT): Eyewitness says now-dead suspect charged at police, was tackled in overnight gunfight. May have been attempting a suicide bombing, per CNN report of explosives on his person. Witness saw suspects shooting at police. One eventually ran at officer and was tackled. Second suspect fled in car. UPDATE (7:46 AM EDT): Police descending on suspect’s apartment. UPDATE (7:19 AM EDT): Globe reporter: police clearing media from area in Cambridge. UPDATE (7:12 AM EDT): WCVB reporter: captured person from last hour not Marathon suspect. UPDATE (7:02 AM EDT): Scanner: pipe bomb detonated in Kenmore Square area (Charles Gate and Comm Ave, near MIT bridge). Police commissioner: controlled detonation by bomb squad. UPDATE (6:57 AM EDT): More school closings. UMass Boston closed. Only major campus I haven’t seen closed yet in Greater Boston is Tufts. UPDATE (6:48 AM EDT): Reddit theory on missing student suffers a heavy blow. UPDATE (6:43 AM EDT): AP claims knowledge of suspects’ nation of origin. All BPS school activities, including Acceleration Academies and athletic events, are cancelled for the day. 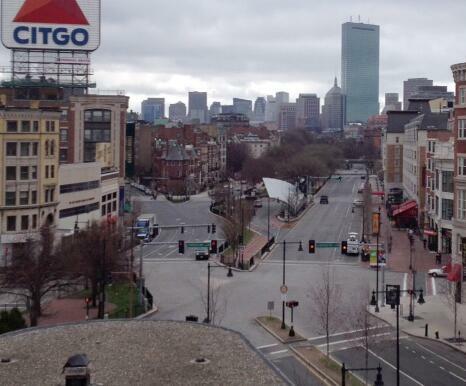 UPDATE (6:34 AM EDT): Emerson College, Suffolk University have also cancelled classes Friday. UPDATE (6:28 AM EDT): Scanner: police on scene sending three photos to ID persons in custody. UPDATE (6:23 AM EDT): Police on scanner have not yet confirmed reported suspect in custody is white cap bombing suspect. UPDATE (6:03 AM EDT): Scanner: reports of male–white skin, dark hair, dark backpack–trying to flag down vehicles in Beacon Park for a ride. UPDATE (5:45 AM EDT): Scanner: All MBTA trains, subways have been suspended. UPDATE (5:41 AM EDT): Dead suspect’s possible blast wounds could have been caused by worn explosives. UPDATE (5:27 AM EDT): At press conference from Beth Israel hospital, doctors say suspect who died had multiple gunshot wounds and evidence of blast wounds from an explosive device. 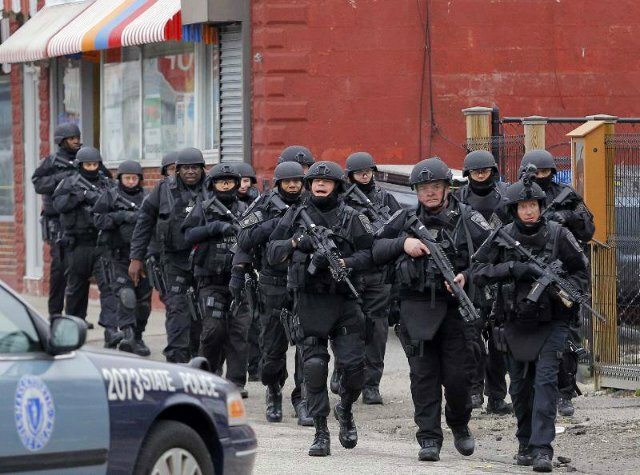 Scanner: police will close down the Arsenal mall in Watertown. Will turn away employees. UPDATE (5:23 AM EDT): MIT has cancelled all Friday classes. UPDATE (5:18 AM EDT): “Law enforcement sources said the suspects have international links and have been in the country legally for about a year,” reports NBC News. NBC’s Pete Williams says that the suspect at large is not believed to be missing student Sunil Tripathi. UPDATE (5:06 AM EDT): Police scanner: bomb sniffing dogs needed from Boston at address of suspicious package near MIT because so many are committed to Watertown. UPDATE (4:50 AM EDT): Evac for residents of streets where suspects left bombs behind. MBTA bus arrived to help evac residents who live where bombs thrown from car. Dexter Ave.
UPDATE (4:45 AM EDT): Suspicious package reported near MIT campus. A suspicious package has been reported in the area of 500 Memorial Drive. Please stay away from this area until further notice. 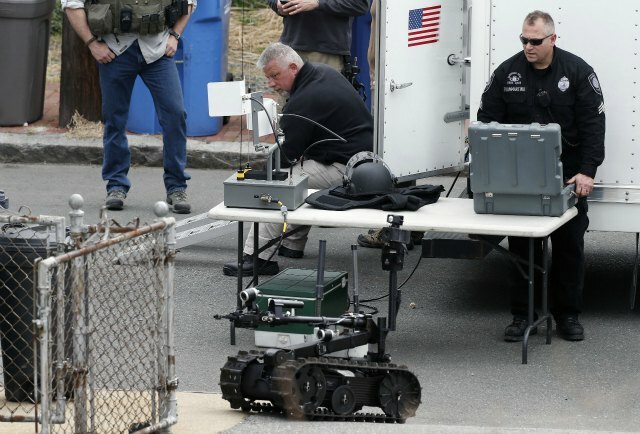 PHOTO: Bomb squad robot in action on site of Watertown shootout. UPDATE (4:29 AM EDT): Boston Globe reports that suspect #2 allegedly robbed a convenience store during the night. 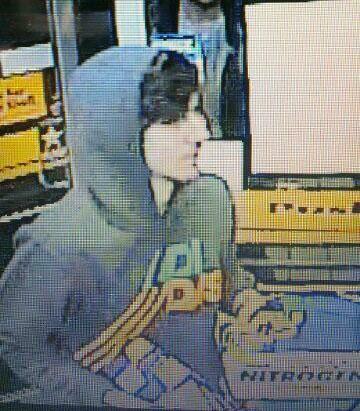 PHOTO: Boston police have tweeted this photo of the suspect at large. UPDATE (4:06 AM EDT): The Boston Police Commissioner says the Boston Marathon bombing suspect wearing a black hat on Monday has died, according to WCVB. UPDATE (4:00 AM EDT): Police are about to begin controlled detonations of devices left by suspects. UPDATE (3:45 AM EDT): Police searching door to door. Police will be going door by door, street by street, in and around Watertown. Police will be clearly identified. It is a fluid situation. 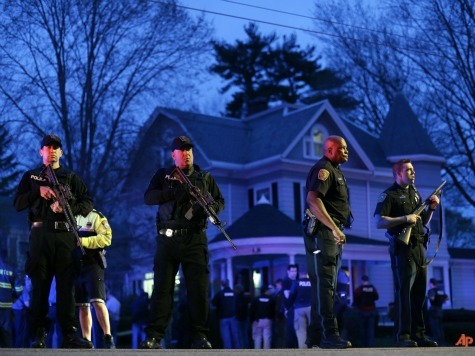 UPDATE (3:42 AM EDT): Massacushetts police advise civilians in Watertown to stay indoors. UPDATE (3:40 AM EDT): Local news says one suspect may be dead. UPDATE (3:17 AM EDT): Police chasing down subject with dogs. UPDATE (3:10 AM EDT): Homeland Security present. UPDATE (3:07 AM EDT): Police Public Information Officer talking to reporters. Revises number of suspects accounted for. Gives details on wounded officer. “One more suspect at large. Two accounted for should be revised. One accounted for. One at large.” – state police PIO. 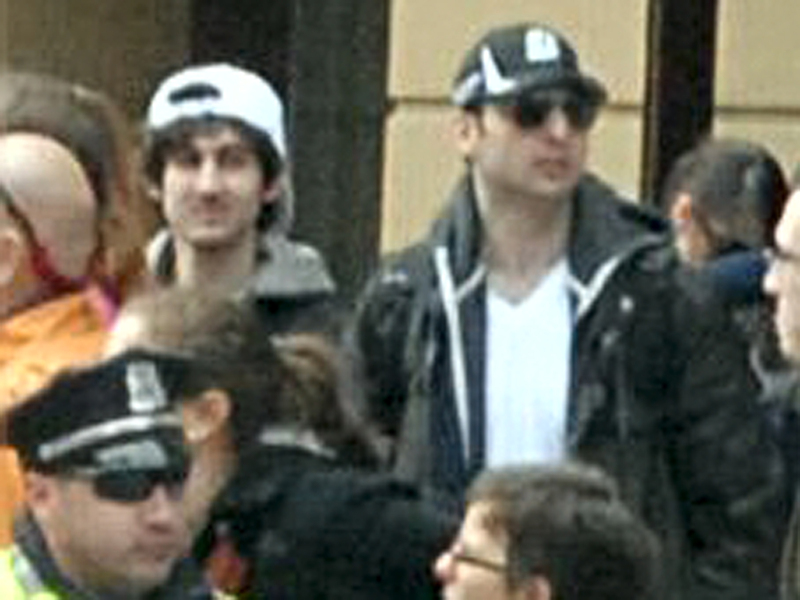 PHOTO: More images of the Boston Marathon bombing suspects released by FBI slightly less than an hour ago. UPDATE (2:40 AM EDT): Massachusetts State Police say there may be more than two suspects. MSP Spokesman: 2 Suspects are accounted for, they are searching for others, did not give a number to us. UPDATE (2:37 AM EDT): A reporter for local affiliate WHDH says that one suspect in tonight’s shootout may be dead. 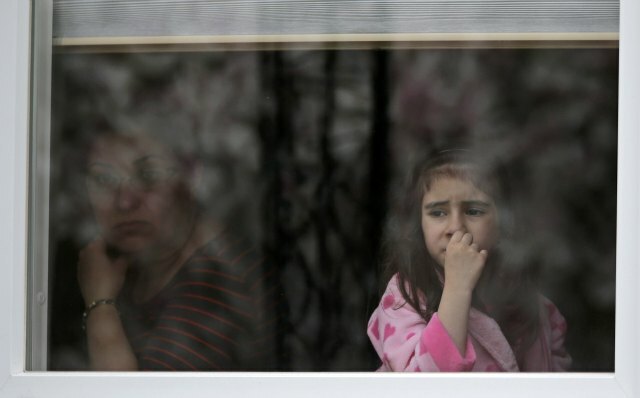 UPDATE (2:27 AM EDT): The Boston Globe’s Jennifer Peter links the situation in Watertown to Monday’s Boston marathon bombing. A marathon suspect is in custody as manhunt continues for another in Watertown, according to official with knowledge of the investigation. 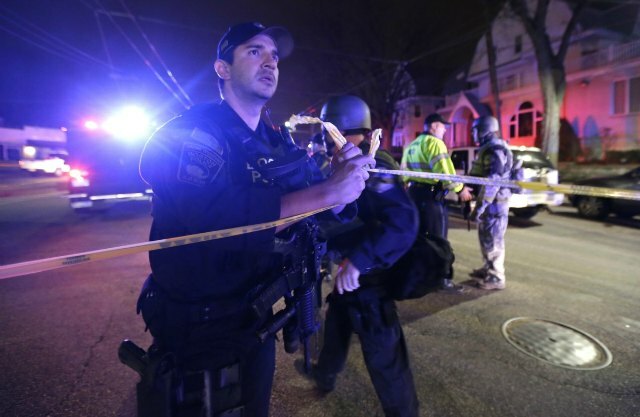 UPDATE (2:23 AM EDT): Breitbart News’s Kerry Picket, on scene in Watertown, says locals saw the sky lit up during the shootout. UPDATE (2:15 AM EDT): A Boston videographer shows the National Guard is now active in Watertown. UPDATE (2:11 AM EDT): All police officers heading to active scenes have been told to power down their cell phones. UPDATE (2:04 AM EDT): Boston police are investigating an abandoned SUV at Lincoln and Spruce St., Watertown. CNN says the situation on MIT’s campus is now over and residents can return to their normal routines. MIT Police have determined that the suspect in this evening’s shooting is no longer on campus. It is now safe to resume normal activities. UPDATE (1:58 AM EDT): Mt Auburn Hospital in Cambridge is reportedly Code Black, possibly meaning a bomb threat. 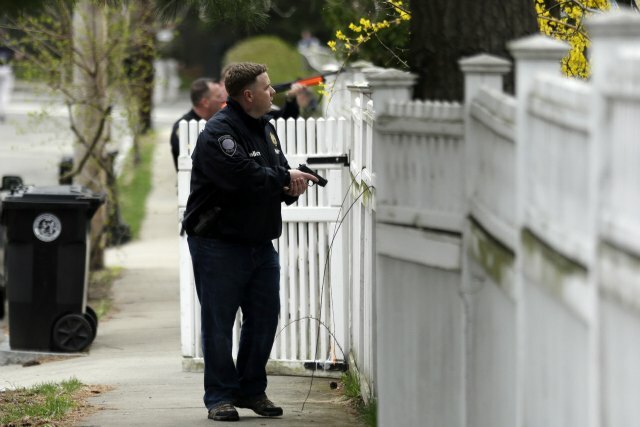 The Boston Globe says FBI agents are in Watertown. 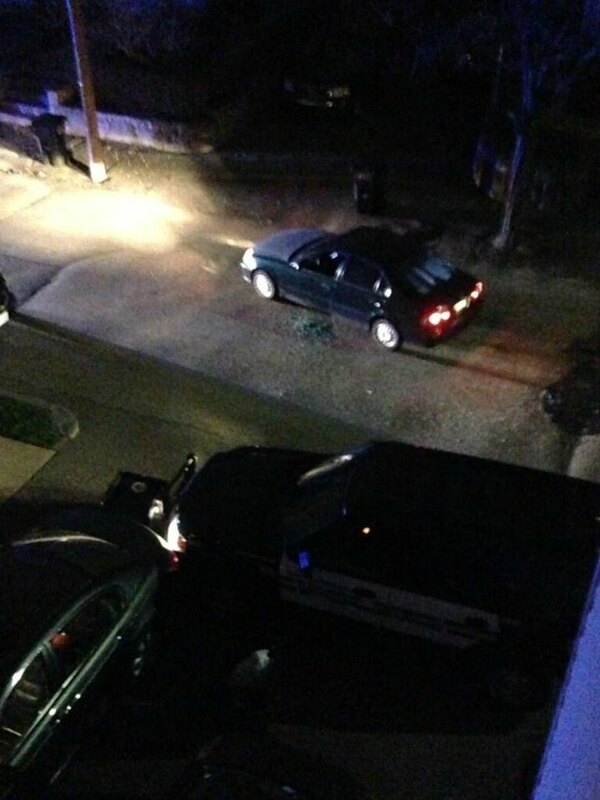 UPDATE (1:50 AM EDT): Seth Mnookin, a professor at MIT, provides a photo of an arrest made on scene. UPDATE (1:46 AM EDT): Jake Tapper of CNN says that the FBI has made its way to MIT’s campus. 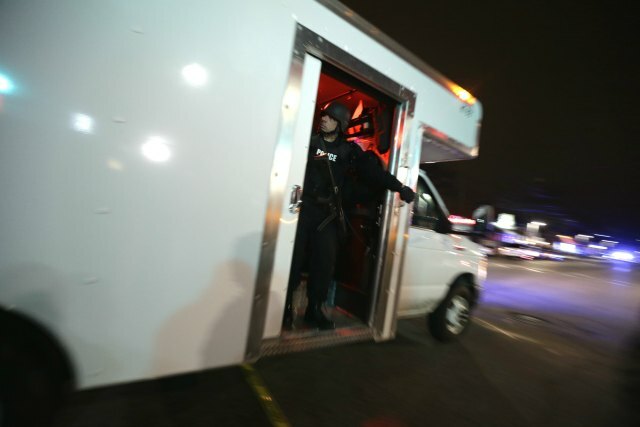 FBI is not yet involved in Watertown shootout. UPDATE (1:44 AM EDT): Kitzenberg says the suspects have left backpacks in the street and the bomb squad is on scene. UPDATE (1:40 AM EDT): Police say the second suspect is not in custody. UPDATE (1:35 AM EDT): Twitter user Andrew Kitzenberg says the gunfight took place on the street outside his home. One police car crashed and all its windows were shot out, he states. Kitzenberg says he heard five minutes of gunfire and says a “pressure cooker bomb” was included in the exchange. 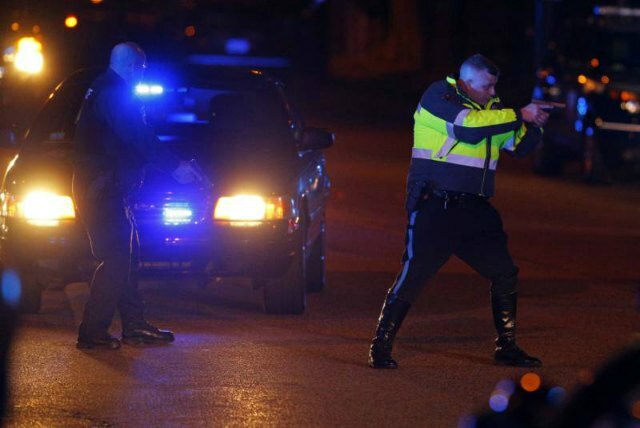 State troopers pursued the suspects and engaged in a gunfight in the city of Watertown. Police radio reported use of hand grenades and automatic firearms. One suspect has been captured and is en route to Beth Israel Medical Center. There are currently conflicting reports on whether the second suspect has been captured or not.